Originally published in 1985, this book provides an important insight into the principal aspects of the history of the policy and practice of political re-education from its origins to 1951. 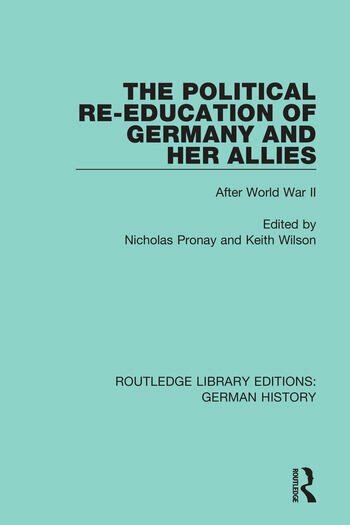 ‘Political re-education’ was the British alternative to the ideas put forward by the USA and the USSR in the common search for a post-war policy which would permanently prevent the resurgence of Germany for a third time as a hostile military power. It was adopted as Allied policy and remains one of the boldest and most imaginative policies in history for securing lasting peace. This book discusses the question of the place of this policy in the preservation of peace and the integration of Germany and Japan into the community of their historical enemies. Introduction: ‘To Stamp Out the Whole Tradition…’ Nicholas Pronay 1. Great War Prologue Keith Wilson 2. The Planning of ‘Re-education’ During the Second World War Lothar Kettenacker 3. The Concept and Practice of ‘Re-education’ in Germany 1945-50 Kurt Jürgensen 4. The Education Branch of the Military Government of Germany and the Schools Arthur Hearnden 5. The Press in the British Zone of Germany Kurt Koszyk 6. In Retrospect: Britain’s Policy of ‘Re-education’ Michael Balfour 7. Welt im Film: Anglo-American Newsreel Policy Roger Smither 8. American Film Policy in the Re-Education of Germany after 1945 David Culbert 9. The Re-Education of Imperial Japan Gordon Daniels 10. From ‘Re-education’ to the Selling of the Marshall Plan in Italy David Ellwood.